I am so excited to share this interview with Russian marbler Olga Kaurova. I have watched her grow and evolve as an Ebru artist since my early days of marbling (in fact, we both took up the art form around the same time!) and I immediately fell for her calm but confident hand at the marbling tank. She is such a devoted practitioner of the traditional form and her personal approach with a modern spin sets her apart. When she started working with musical performers on stage, it was thrilling not only to watch her creations reveal themselves in a dance with the notes, but also to see how beautiful marbling collaborations can be. It was truly inspiring. 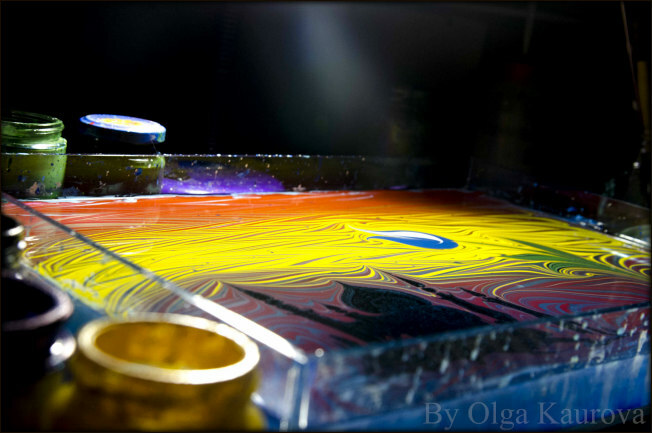 The beginnings of Olga’s marbling journey was not an easy one. Finding it challenging to learn about the art form in Russia, she had to turn to the birthplace of Ebru, Turkey (and had to learn how to speak Turkish! ), and when she did, the pieces of the puzzle fell into place. She’s been nonstop ever since. Her firm belief in “going deeper” into her Ebru studies, something I admire greatly, continues to propel her. I also respect the way she embraces impermanance, specifically when she’s working on stage. Olga’s enthusiasm and passion for marbling really comes through in this interview and she is such a delightful person to talk with. I hope someday we can be in the studio together. In the meantime, I’ll continue to enjoy her style and work through her videos and images. 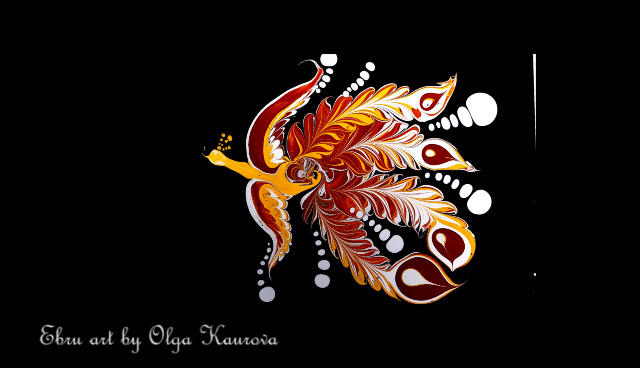 Olga, correct me if I’m wrong but I believe you are the only artist in Russia specializing in Ebru, and if not, you’re definitely one of only a few. How did you first discover/learn about the art form, what attracted you to it, and why were you compelled to learn how to do it? I’m not the only Ebru artist in Russia. I have some wonderful colleagues who create professional and good artwork. While there aren’t too many people who do real Ebru in Russia, it is starting to become popular in my country. 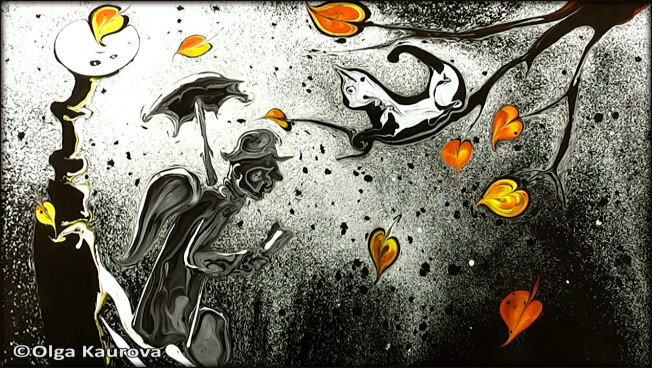 I discovered Ebru for myself at 2009. I was searching some videos on YouTube about making paper and it showed me some videos about Ebru. I was shocked in that moment! I couldn’t believe it was possible to draw on water and then print the picture on paper! I started to research more about it but couldn’t find anything because at the time in Russia, nobody knew about this art form. I found something in English but it wasn’t enough. After, I started to learn the Turkish language in order to understand what Ebru is and how to prepare materials. Take us on your marbling journey…how did you learn how to marble? Did you take a class and if so, from whom? Are you self taught? Did you learn from a book or video/CD? All that I know and all that I make, I learned by myself. I didn’t have any teacher who could help me. 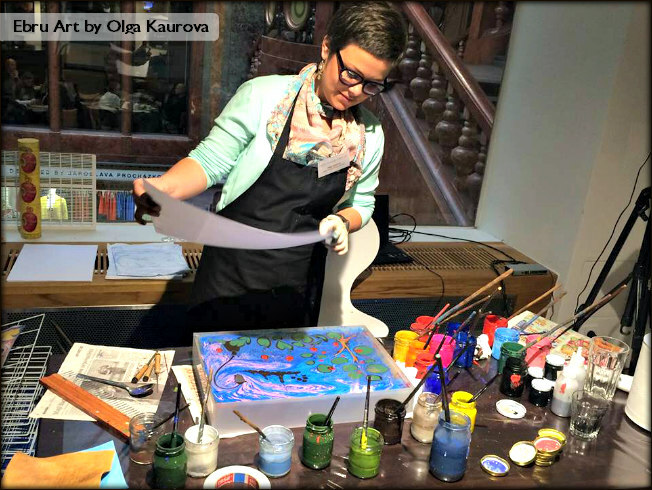 I tested everything that could be suitable for marbling in Russia, but when I visited Turkey, Ebru opened up to me – paradise!! When I bought my first colors and kitre*, the road from the golden brick to the emerald city was opened for me. *Editor’s note: kitre is known as tragacanth, which is used to make the marbling bath. How would you describe your marbling style (i.e. traditional, contemporary, experimental, modern, etc.) and why do you approach the art form that way? My style is modern, but I also always use traditional elements. I like to draw traditional Ebru patterns and flowers but I prefer to create live pictures. I create a water show and my pictures change every time as the colors dance on water. Yes, as I said earlier, this show is my main type of Ebru work. Everything that people see on the stage is 100% a live show. Of course, I prepare and have a plan of what I will draw and which pictures I will create, but when I am on the stage, I can change my program very easily. Sometimes I have such big inspiration and high energy, I decide I want to create something very different [from the plan]. And so I make it! I have lots of experience working with almost every musical style: classic, pop, electronic, rock music. Russia has a rich arts culture that includes literature, ballet, architecture, and the visual arts. 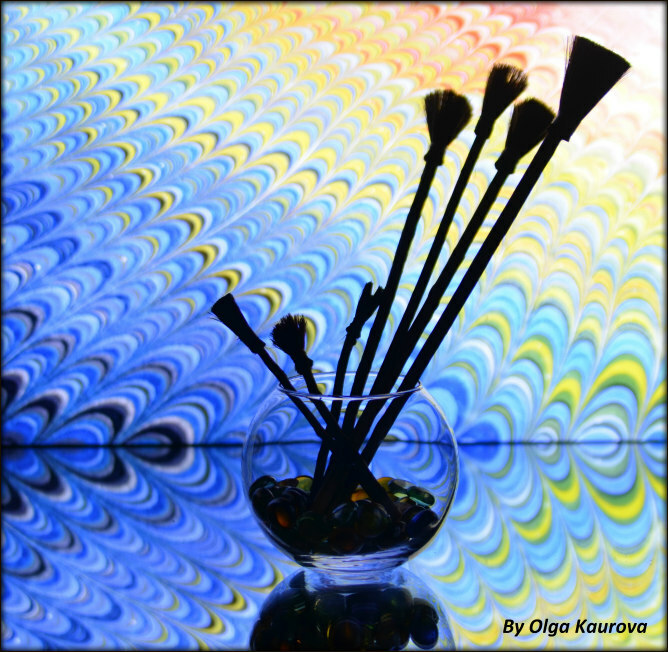 How well known is the art of marbling in Russia and how do people perceive it or respond to it when they first learn about it? Well, it is very strange to me that Ebru still is not popular in Russia, but I think that is because it is really difficult to study Ebru. I talk about the traditional art form. Acrylic paints are now available and it is not a problem to buy them and start to draw. People like to look but don’t like to study. They want to have an immediate result, but that is not Ebru. You need to study very hard to learn this art deep. But today, the biggest problem is that people don’t want to look deep. 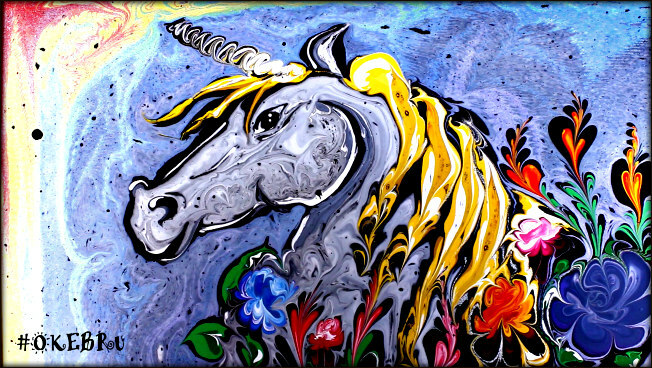 What are your long-term goals as an Ebru artist? Do you want to continue to teach/continue to collaborate with musicians? Do you want to expand into other opportunities? Do you have a dream project? Ebru is my life. It gives me energy and power! And I have grandiose plans to develop myself as an artist. I have two dream projects, but now they are a secret. I hope very soon you will hear about them! Is marbling a full-time job for you? How often do you get to marble, both professionally (like teaching and working with musicians) and personally (just for fun)? Ebru takes all my time. I’m working every day. Marbling for me is job and also rest time. Confucius said, “Choose a job for yourself, and you do not have to work a single day in your life.” But I’m training very often. Marbling for me is like a sport: you need to repeat every pattern again and again to be the master! I use traditional brushes, which I make by my hand. My favorite stylus is a porcupine needle! Combs I order in Turkey. 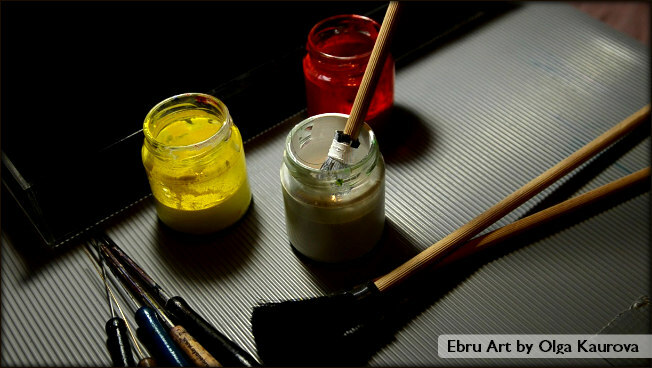 Ayan Ebru [a retail store in Turkey] makes the best tools for Ebru! Do you have any rituals, habits or practices that you do before you step into the studio to marble? Sometimes before go on stage, I close my eyes and stay absolutely quite for several minutes. It helps me to forget reality and enter into my colorful world. “Painting by Music,” with classical guitarist Artur Bochkivskiy. What is the greatest challenge (either technically or mentally) you face when it comes to marbling? The greatest challenge for me can be when I get some unusual orders. My clients can be very creative. One time I was asked to draw an elderly surfer! And I had to show that he is a very, very old surfer! What advice would you give to a new marbler or someone thinking about taking up marbling? My advice to beginners is very simple: work hard and look deep. Are you working on any new projects that really excite you right now? I have two new projects. One is that I will take part in a light festival in Portugal soon and I am very busy preparing for this event. The second project I will keep in secret for now. Is there a marbler (or marblers!) that you admire and why? I know a lot of great marblers. I admire Garip Ay, Hikmet Barutcugil, Firdevs Calkanoglu, Mahmut Pesteli. 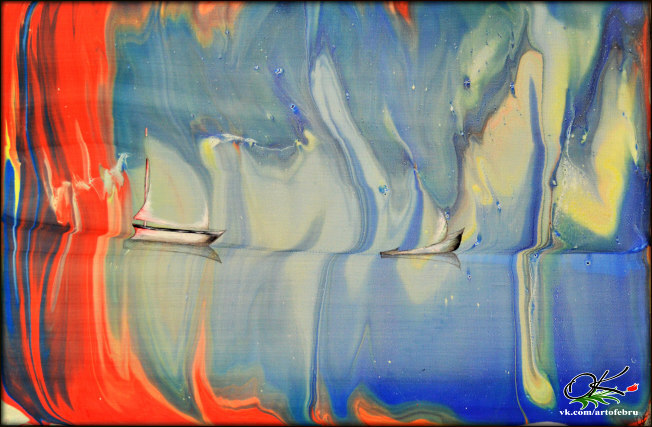 They are my favorite Ebru artists. The Nightmare Before Christmas (Tim Burton style)! Marbling a car (projected) at a car show!